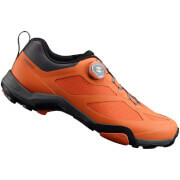 Shimano XC51N Cycling Cross Shoes with Dynalast technology for a precise fit and more efficient pedaling over rough terrain. Made of tough synthetic leather with a low armour profile, the upper also features a sealed design with no-mesh for comfort in every season. Fastened with a low-profile micro-adjust buckle, this keeps the shoes securely on your feet and reduces impact. The Cross X strap is designed to relieve tension around the top of the foot during the push off motion. - A.D. Purchased these to replace my xc50’s That I’ve had for many years and loved. These are very similar and I am satisfied, Shimano is not really making shoes like these anymore I’m sorry to say. Bought these on the 12/10/15 and have faced 1 brutal winter and currently facing another. I use these for commuting as well as CX and they are still all intact over a year on. No signs of wear or tear. Very comfortable and stiff sole gets the power down. Great product, great fit. Love this shoes. I'm giving it 4 stars instead of 5 is because I have trouble figuring out the Shimano sizing charts, they are probably big by about half a size. I find the toe box wide in Shimano shoes (I have a wide foot and bought regular width) and the stock Shimano foot beds to be lacking in support. With by extra thick molded foot beds they fit good though. 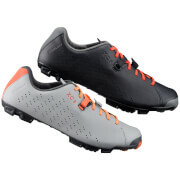 These shoes live up to want I want, well priced fall/winter/spring shoe with no ventilation to help keep a little warmer on the CX bike. These shoes are good all-rounders. Comfortable, splashproof, stiff and OK to walk in. They do, however, look very plain! Recommended. Bought these to get through the upcoming muddy winter. Very happy with them so far. They feel tough in all the right places withought feeling heavy. Sizing was what you would expect them to be too. Highly recommended!